ZgPHP Meetup is the event organized by Zagreb PHP community and during the years it became a central point of sharing ideas and knowledge among PHP developers in the region. The event started with an opening word and group announcements by Tomo, following with short speech by CEO’s Ivo. Ivo said a few words about Netgen, not missing a chance to invite all to hands-on and engaging annual event, Web Summer Camp. In his speech Code archeology – refactoring legacy app, Ivan Herak presented his report from the trenches, something every developer is faced with, the legacy code. This was Ivan’s guidelines and suggestions from his rich and exhaustive experience. After that, Ivo Lukač and Edi Modrić talked about open sourcing our flagship, the Layouts, with the focus on why company opened sourced it in the first place and what challenges this brought. 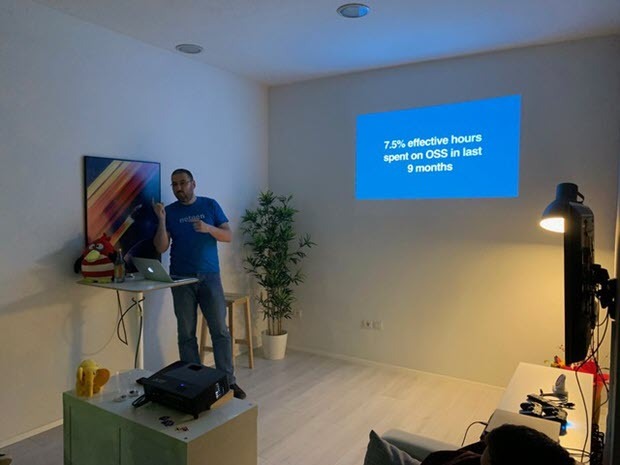 While talking about contributing to OSS, Ivo presented an interesting fact – Netgen spent 7,5% effective hours on OSS in the last 9 months. After the official part was over, all continued chatting and hanging out, spiced with pizzas and beers.